An interesting murder mystery that is a little too long and too much about environment and atmosphere, when it should be more of a gripping thriller. Midnight in the garden of good and evil might look like a crime thriller, but it’s not. It’s barely even a murder mystery. That’s because we are very aware, the whole time, of who did the murder, and the only question is whether or not it was self-defense. Searching for that truth and what really happened the night of the murder is the quest of the story. It’s not really enough for a movie unless there are multiple theories, suspects, and possibilities. In this movie, there really aren’t. And so the movie uses it’s atmosphere almost like a character to propel the story along. 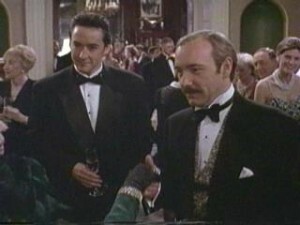 The film is about a reporter for town and country magazine named John Kelso (played by John Cusack), who is hired to cover the extravagant Christmas party of a very wealthy socialite. That man of enormous wealth and popularity is Jim Williams (Kevin spacey). He invites Kelso to the party, meets him the day before, and welcomes him to Savannah, Georgia. The two of them go walking around and meet some interesting people. One man walks an imaginary dog. Another is Williams’ lawyer who tries to get Kelso to sign some papers about being discretionary about what he might see at the party. Kelso refuses and Williams admires him for it. We also meet Mandy, played by Allison Eastwood, the director’s daughter. She’s the love interest of the film. The night before the party, Kelso and Mandy go out and walk around and even show up at a sort of pre-party evening of fun at Williams’ house. The next morning a woman shows up at Kelso’s door with a tuxedo for him to wear, and before you know it, we’re at the evening party. During this party, Williams walks around with Kelso and spends more time alone with him than any party host really would. Instead of mingling with the different guests, Williams seems only interested in Kelso and it’s a little strange. When a young man named Billy (played by Jude Law) busts in and threatens Williams, Kelso is shocked. He starts to think Savannah might be more interesting than he expected. And that night, Kelso is woken up by the sounds of sirens rushing by his window. He gets out of bed, walks over to Williams’ house and finds out that Williams has shot and killed Billy. Now, at last, the real story has begun. The rest of the movie will be about the trial of Jim Williams. And it takes a while to even get to that. First he and Kelso have to go around town talking to people, such as a voodoo witch doctor woman who takes them into a graveyard to perform some kind of communicating with the dead, while standing over a grave. The movie is interesting the whole way through, but it just takes way too long for anything to happen. That’s because it is absolutely soaked in atmosphere and colorful characters that don’t necessarily add anything to the plot. Take this woman who wears a mink around her neck at the party. She is a drunk and a ball of laughter, and kind of fun, but she adds nothing to the story. And yet she appears in multiple scenes of the characters just going over to talk to her. The same can be said of a transvestite known as the Lady Chablis. This is a black woman who was once a man and all of the characters seem shocked when they learn that. I don’t know how they couldn’t tell, just by her voice and mannerisms. This character offers absolutely nothing to the storyline. Her supposed reason for being in the movie is that she knew Billy and her roommate used to date him. But we never meet the roommate. She gets called to the witness stand, but doesn’t really have anything to offer. She’s on the stand more for humor than for relevance. And she gets a number of scenes that are devoted entirely to her and have absolutely nothing to do with the case. The longest one has her show up at a ball that Kelso is attending for wealthy African Americans, and start dancing provocatively with some of the young men who are there. What does this have to do with anything? Nothing at all. We never lose sight of the point of the story, that there was a murder and we are now trying to hear the truth about what happened, or at least to see if the defendant will be set free. But so much of the movie has nothing to do with that. Only in the last fourth of the film do things really start coming together. We finally get a flashback that shows us a new take on what might have happened. And there is an interesting new discovery about bagging the hands of the dead victim that ends up making a big difference in the case. We could have used a lot more of this kind of thing early on. 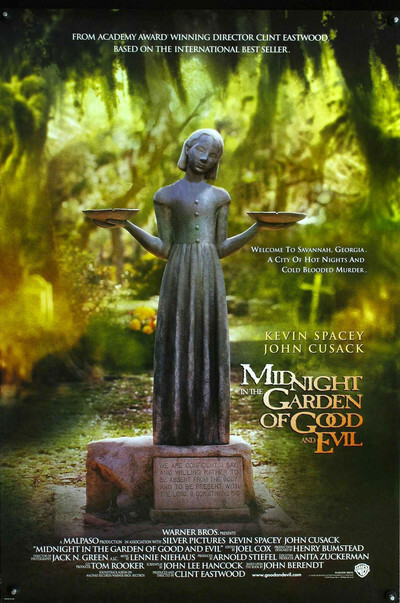 Midnight in the garden of good and evil is a Clint Eastwood directed movie, and what that means is that it’s long. Much longer than it needed to be. This movie is all about the atmosphere and the characters, and unfortunately that means it is very often not about the story. If only it concentrated more on the murder plot and trial and less on everything else, it could have been a pretty gripping film. Instead, it is sometimes fun, sometime irrelevant. It’s not a bad movie; it’s just overly long and filled with scenes that should have been cut out. It’s a movie that is meant for one who has patience and can appreciate atmosphere and style. In those areas, this movie is a big success.